We knew that Crisp Point Lighthouse was remote yet charming, but nothing prepared us for the beautiful sight that greeted us upon our arrival. 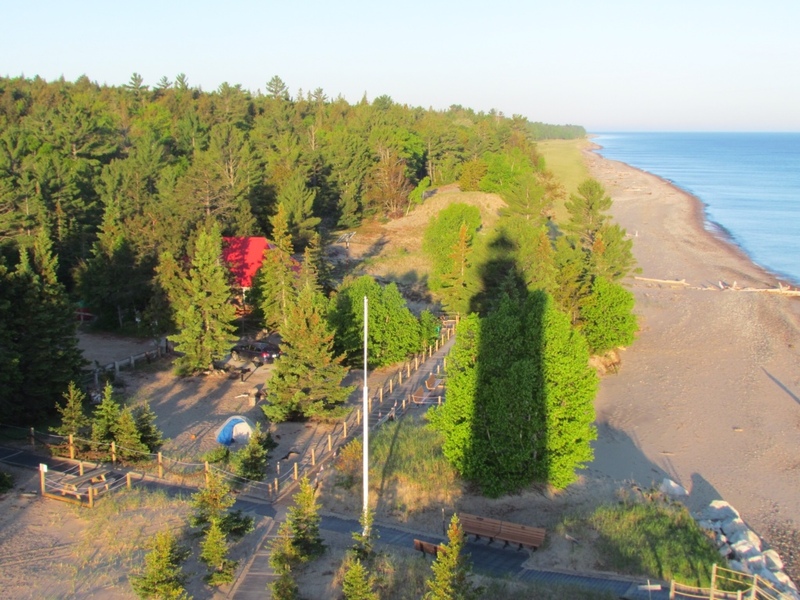 Not only was the tower in good repair – having been brought back from the brink of endangerment in 1997 – but it’s supporters have rebuilt it’s service building, constructed a visitor center and landscaped the area with boardwalks and plantings to protect the dunes. 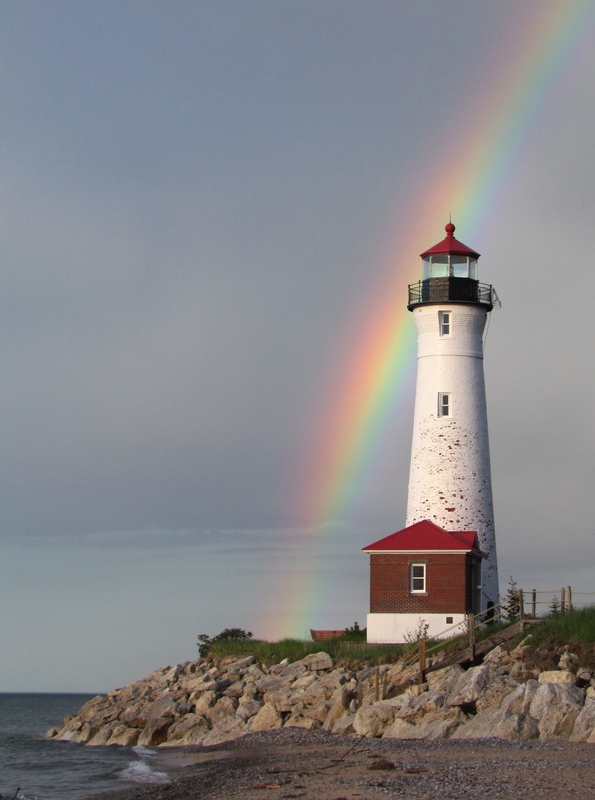 It’s truly a testament to a dedicated group of individuals in the Crisp Point Light Historical Society. Along with a thorough orientation by the volunteers who preceded us on site, we knew we were off to a good start for our 5-day stint as lighthouse hosts. 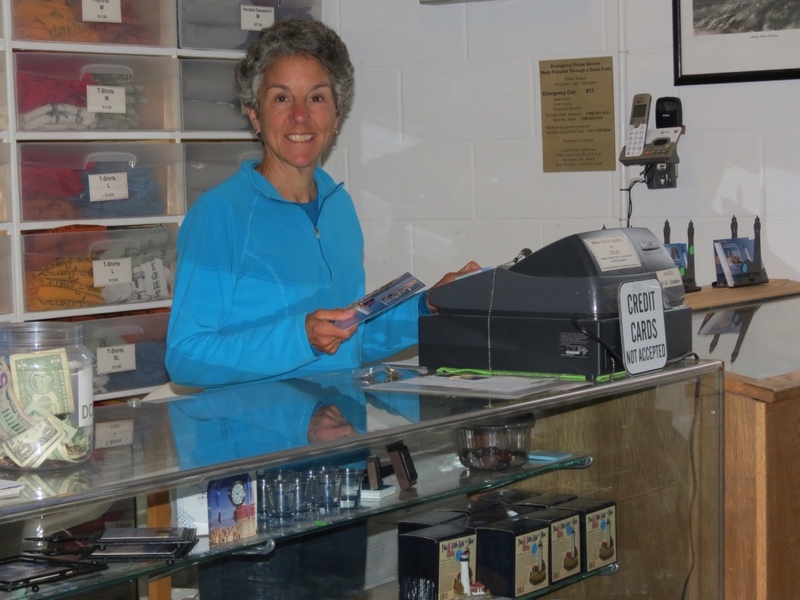 We have easily settled into our job of manning the visitor center. There we are surrounded by an impressive array of lighthouse souvenirs to sell, along with displays of historical items. It is easy to linger and read the various pieces of literature in our downtime, absorbing more lighthouse history. With plenty of slow periods, we can easily take turns minding the shop and wandering the grounds.Greeting visitors is the best part of our duties. At times the whole parking lot is full, and at others we have a slow flow of customers who dribble in one vehicle at a time. Some even come by dirt bike or ATV. But they are all unique and come for different reasons. For those new to the lighthouse, just surviving the road to reach it feels like an achievement, but invariably worth it. And there are those who have been coming for years. They have great stories to tell, having seen the place before it’s recent improvements. 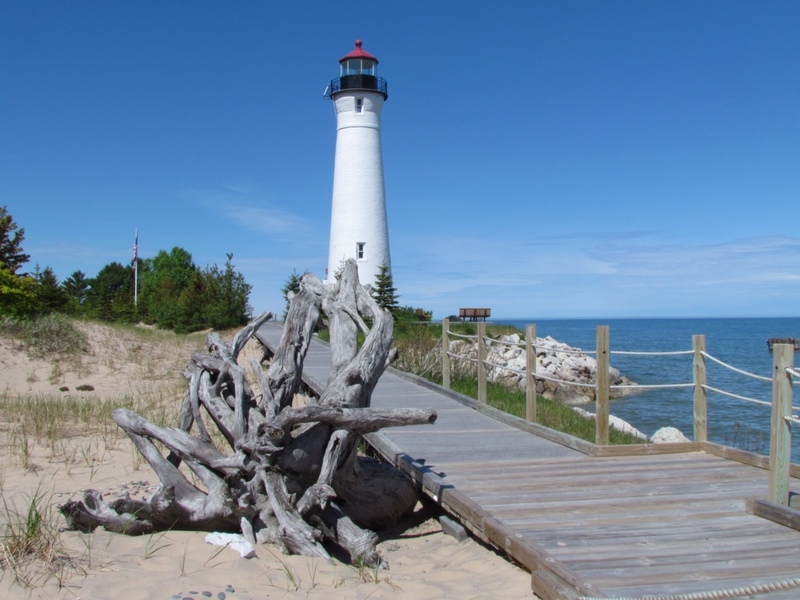 Or when they could walk the beach in front of the lighthouse – land which has since been reclaimed by Lake Superior. 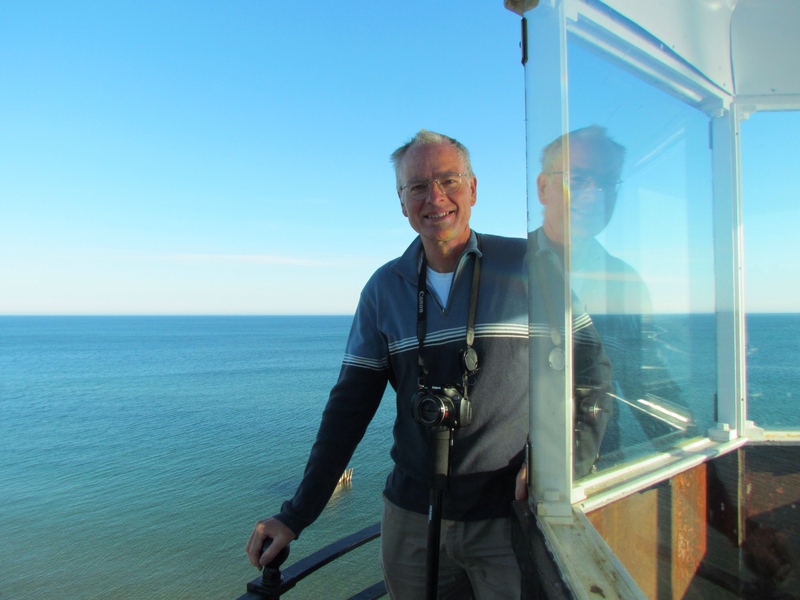 We even met a man who once spent hours in the cold October Lake Superior waters to help build barriers to protect the lighthouse – all done by hand. And then there are the avid lighthouse collectors, on a quest to visit as many lighthouses as possible. Finally, those who come for a different reason entirely – rock hunting on the beach. All have something to share, enriching our own experience while on duty. Outside our lighthouse obligations our life is pretty simple here. We have a campsite in a tidy enclosure, surrounded by the sturdy boardwalks leading to the lighthouse, beach and viewing areas. 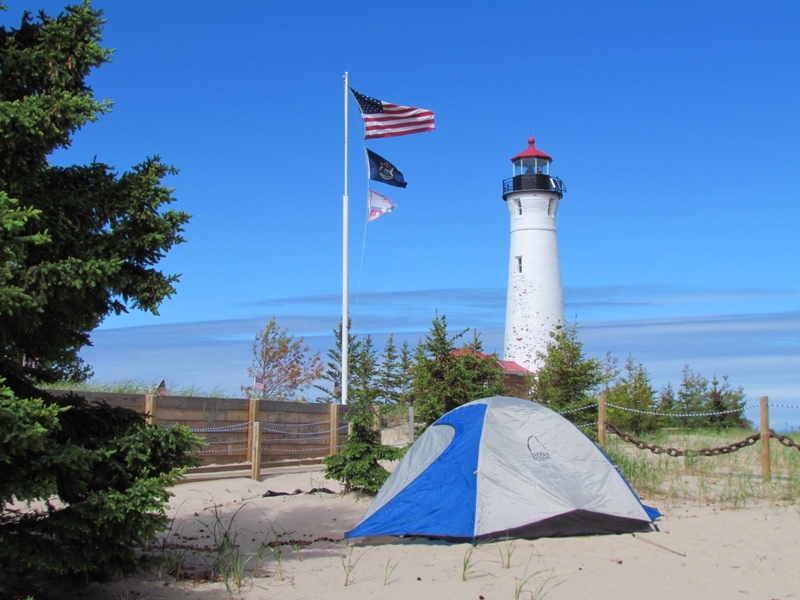 It has everything we need – a grill, fire ring, picnic table and soft sand under our tent for comfortable sleeping. The longer we are here, the easier it is to surrender to this existence. Our world is small, but the beaches and the horizon stretch forever. Our options are limited, but I have little need for much besides a good book to read. Our technology is rendered useless, but I don’t really miss it. In fact, it’s quite liberating not being a slave to the internet. This place is a photographer’s dream. At this time of year we can see both sunrises and sunsets, with the lighthouse adding a dramatic setting. Even I tend to carry my camera around wherever I go. Somehow the lighthouse takes on a different appearance throughout the day, and we never tire of looking for new angles or shots to take. Theoretically we have pure dark for vivid stars and night skies, although the clouds have not obliged on that front. But a short cloudburst this evening delivered a stunning rainbow – an unexpected gift. Being able to go up in the lighthouse tower is a treat, particularly in the off- hours. From there we can survey our surroundings, seeing it from a new vantage point. A perk of the job. And the visitor center has proven to be a godsend. Numerous times we have sought shelter there, whether it be from the wind, the rain or the ravenous mosquitoes. A haven for hassled campers. Yes, it’s a good gig we have here. Definitely worth repeating. We’ll be back again next year to tend the light. This entry was posted in Travel and tagged Camping, Crisp Point Lighthouse, Lake Superior, Photography, Travel, Volunteering by Molly. Bookmark the permalink.